small resort known as the Balcony of the Pre-Alps, Moléson-sur-Gruyères lies below the 2002m peak of Le Moléson, from where there are spectacular views of Gruyères, the Jura, Lake Geneva and the Alps as far as Mont Blanc - and enough piste to justify a day trip (or longer for novices and early intermediates). 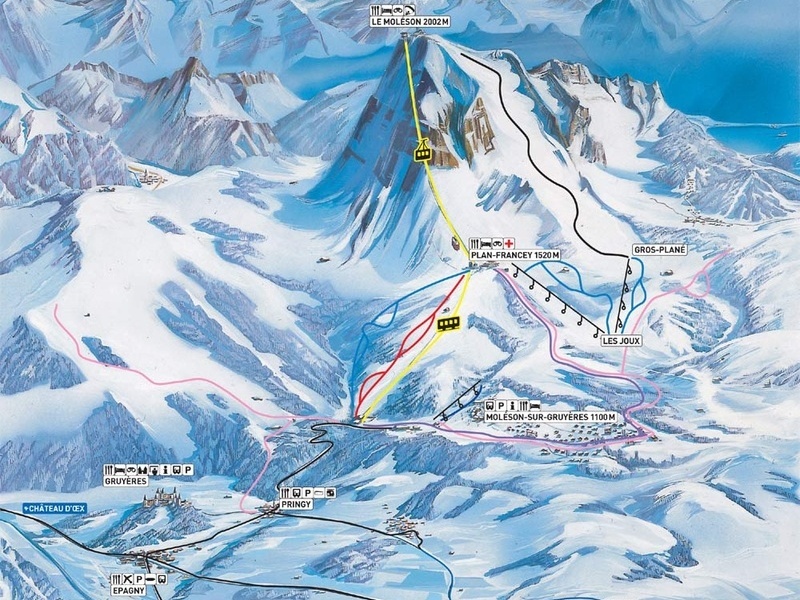 There are several other resorts in the area too, all much cheaper than the Alpine resorts, with a reasonable snow record and the closest slopes to Fribourg, but Moléson probably offers the most variety and challenge. It also has a superb 4km toboggan run. The runs in Moléson comprise a separate nursery area in the village, two T-bar served challenging blue runs (with a small park) above Les Joux, a valley run from Plan-Francey with a red and blue variant and a hugely varied black off the peak of Le Moléson. The black run starts in a wide, unprepared and relatively steep bowl, takes in a few traverses and narrowish bits before opening out on a lovely piste that joins a blue run at Gros-Plané. Sleds can be hired from the funicular valley station for the toboggan run from Plan-Francey. 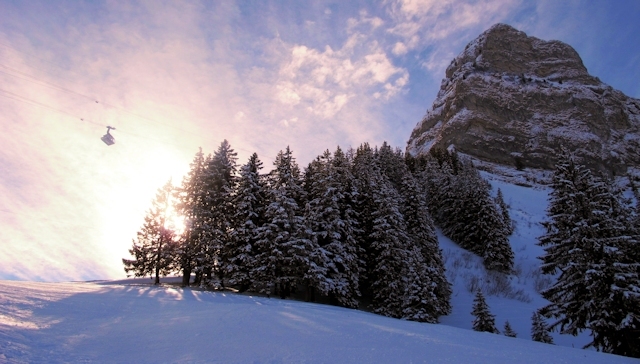 The Piste du Sommet run off Le Moléson is probably the most varied and challenging runs in the Fribourg Region, with a distance of around 4km and a drop from 2002m at the top of Le Moléson down to 1315m at Les Joux. The views from the summit and top section of the run are spectacular. You are in Gruyères, so it would be churlish not to take in a fondue while you are here. At Restaurant de l'Observatoire, atop Le Moléson at 1982m, you can take in the stunning views while you eat. 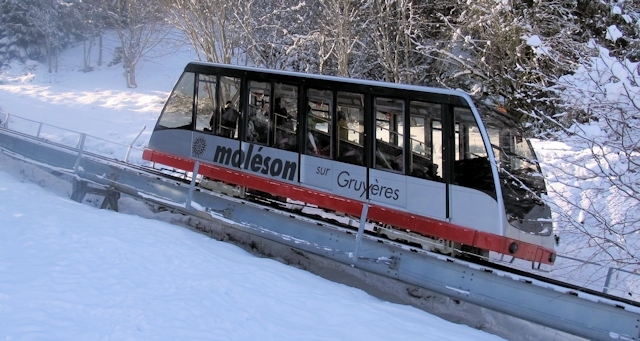 The best destination to access the downhill slopes by public transport in this ski area is Moléson-sur-Gruyères . Bus stop next to funicular car park. From Basel the least travel time is 2 hrs 53 mins with as few as 4 changes going via Bern / Fribourg / Bulle / Gruyères. From Berne the least travel time is 1 hr 48 mins with as few as 3 changes going via Fribourg / Bulle / Gruyères. The road distance from Zurich is around 187 km and the journey time is roughly 2 hrs 5 mins. The road distance from Basel is around 161 km and the journey time is roughly 1 hr 45 mins. The road distance from Berne is around 69 km and the journey time is roughly 1 hr. The road distance from Geneva is around 125 km and the journey time is roughly 1 hr 31 mins. The road distance from Lausanne is around 59 km and the journey time is roughly 50 mins. The road distance from Fribourg is around 36 km and the journey time is roughly 36 mins. Other resorts nearby include Château-d'Oex and Rougemont.